Glen Austin is a true conservation treasure trove and is home to one of the last remaining African Giant Bullfrog breeding pans in the world. The Giant African Bullfrog (Pyxiecephalus Adspersus) is the second largest frog in the world, with males reaching lengths of between 17 and 20 cms (body alone) and weights of over a kg. On the border of the Ekurheleni Municipality, the pan is home to the ancient breed of the African Giant Bullfrog, and is at the site of an ephemeral wetland, which comes alive during the rainy season. 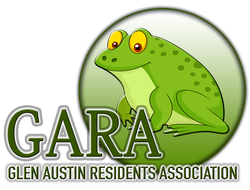 Currently home to this threatened species as well as a myriad of additional frog species, the area was until the mid 90’s privy to the summer season migrations of the bullfrogs where literally thousands of Giant Bullfrogs invaded the properties and the roads of Glen Austin. insects, earthworms and the ugly hook worms (which decimate our vegetables and gardens). The Giant African Bullfrog, Pyxicephalus adspersus, is the second largest frog in the world, the largest being the Goliath Frog, Conraua goliath. 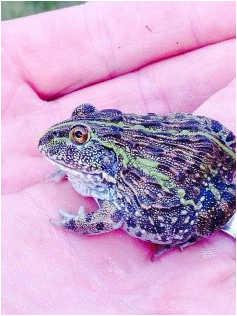 Vendors in the pet trade often use distortions of the African Bullfrog's scientific name, such as "pixie frog" and "pyxie", to refer to the young froglets that often surprise new pet owners by growing into monsters. Adult males can weigh well over a kilo (over 2.2 lbs) and males typically reach a snout-to-vent length of 17.5 cm (7 inches); specimens over 20 cm (8 inches) have been recorded (Passmore and Carruthers). Females rarely exceed 12.5 cm (5 inches). Most anurans exhibit sexual dimorphism in size, generally the female being larger than the male. The African Bullfrog exhibits extreme size differences between the sexes, but the male is the larger animal. Males also have more powerful limbs and larger skulls. In the wild, some larger male African Bullfrogs in a population will demonstrate parental care by guarding their tadpoles against predators and, when necessary, insuring sufficient water is accessible to their brood by digging channels between pools (Balinsky and Balinsky; Kok and Du Preez; Cook, Ferguson and Telford). ​These guardian males have been known to attack animals much larger than themselves in defense of their offspring. The size differences between the sexes are probably due to this parental behavior and the violent fighting that occurs between males at breeding time. Fighting takes the form of grasping an opponent in an attempt to flip or throw him (Passmore and Carruthers). These frogs are equipped with bony tooth-like projections called odontoids, located in the center of the lower jaw, which can deliver a very painful and bloody bite to an opponent or the finger of a human being. When forced on the defensive, these frogs will puff up with air to appear as large as they can, and in the case of guardian males they will lunge at the attacker with jaws open in an attempt to deliver a discouraging bite.